On his third Criss Cross leader date, Mike Moreno convenes drummer Kendrick Scott, who played on his fellow Houstonian's prior Criss Cross outings (Third Wish [Criss 1303] and First In Mind [Criss 1338]) and bassist Doug Weiss, who played on Third Wish. 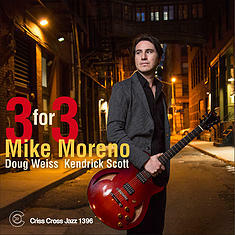 They frame the 39-year-old guitarist's sui generis tonal on a program culled from the corpuses of a multi-generational cohort of heroes: jazz songs by Charlie Parker (" Perhaps "), Wayne Shorter (" The Big Push "), Joe Henderson (" Serenity ") and Mulgrew Miller (" For Those Who Do "); songbook gems by Michel Legrand " You Must Believe In Spring "), Johnny Mandel (" A Time For Love ") and Vernon Duke (" April In Paris "); plus one apiece by Radiohead (" Glass Eyes ") and Lo Borges (" Clube Da Esquina No.1 "). As always Moreno finds fresh pathways through familiar sonic landscapes on a date that is a master class in triological conversation.